Everyone has now heard of carpal tunnel syndrome. The term is seen in everyday magazines, is used commonly in texts and tweets, and is even the name of a musical group. Carpal tunnel syndrome is the most commonly occurring nerve compression of the upper extremity. It is caused by the median nerve becoming pinched at the wrist causing numbness in the thumb, index finger, middle finger, and partially in the ring finger. It can cause weakness in the muscles at the base of the thumb and cause pain that radiates up the arm into the shoulder and neck. Like the older sibling who gets blamed for all wrong-doing, carpal tunnel syndrome has become synonymous with all hand pain. Lurking in the shadow of carpal tunnel syndrome’s fame is its counterpart, cubital tunnel syndrome. Cubital tunnel syndrome is the second most commonly occurring nerve compression of the upper extremity. It is caused when the ulnar nerve, running parallel to the median nerve in the forearm, becomes pinched at the elbow. When you hit your “funny bone”, you are actually hitting this nerve. The ulnar nerve is responsible for sensation in the small finger and partially in the ring finger. 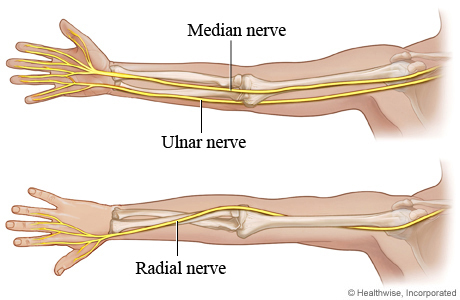 Trauma to the ulnar nerve can cause pain in the small finger side of the hand that radiates into the forearm towards the inside of the elbow. It can cause weakness to the small muscles in the hand and, if severe, loss of coordination. 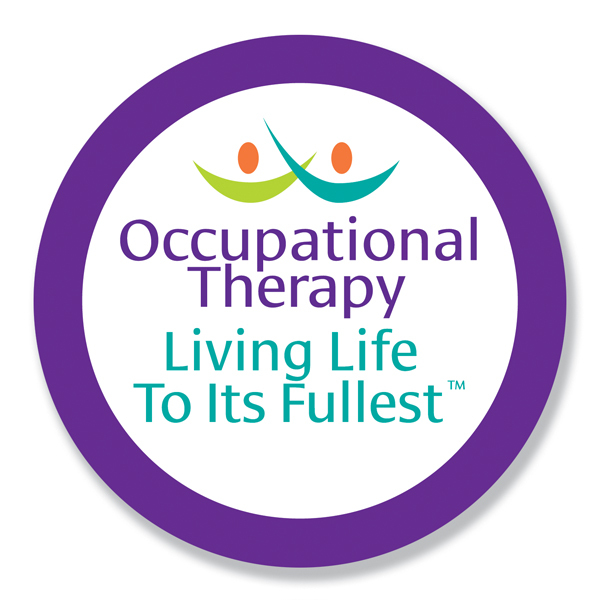 It is time to bring cubital tunnel syndrome out from behind carpal tunnel syndrome’s shadow. If diagnosed correctly, there are simple modifications that can be made to help relieve the symptoms of this frequently overlooked nerve compression. sleeping with the elbow bent – use pillows for support; wrap an ace wrap or towel loosely around the elbow to keep it from bending; avoid sleeping on the arm or sleeping with the hands positioned up behind the head. holding a phone to the ear – use a head-set. driving – adjust the seat position so that the elbows are open and relaxed; avoid resting the arms on the elbow supports or window sill. computer work – position the height of the keyboard and mouse so that the elbows are open a bit more than 90 degrees. playing the guitar (because of the positioning of the fretting hand) – warm-up prior to playing, take frequent breaks, stretch often. Don’t lean on the elbow. Don’t lean on the forearm, especially if it is placed over the hard edge of a desk or table. 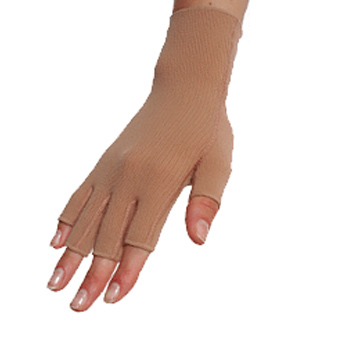 Place a soft support or cushioning under the forearm. Position the mouse and the keyboard in front of you so that you do not need to reach forward or out to activate them. The mouse and keyboard should be low enough that the shoulders are relaxed. Activate the mouse by keeping the wrist solid and using shoulder movement for positioning. Keep the wrists neutral. The wrists should be flat over the keyboard, not bent forward or back. The wrists should not be angled towards the small finger while typing. Using a split keyboard or a vertical mouse may help position the wrists correctly and relieve tension in the forearms. Avoid over-developing the triceps during gym and sports activities. take frequent breaks when performing repetitive work. warm-up prior to performing strenuous activity. avoid or modify activities that cause pain. use cold packs to control post-activity pain when necessary. Need more information? Or want to share your experiences or ask questions of our community? Visit us online at HandHealthResources.com or via our Facebook or Twitter accounts.